I love to entertain people; I love to cook and bake in order to bring joy to someone’s face, even for a moment. There’s just something about gathering around the table to share a meal…it’s something so simple, and yet it is such an important part of life. 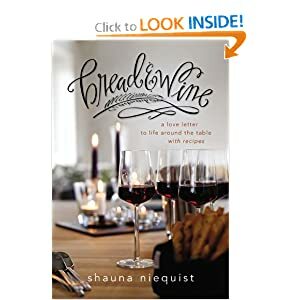 Bread and Wine: A Love Letter to Life Around the Table with Recipes is a beautiful, relevant, and helpful book in so many ways. I related to the author in almost every single chapter and had many moments of “me too!” as I read. Shauna shares stories of how cooking/gathering for meals have impacted her life, nourished her soul, and other lessons she has learned along the way. She includes tons of recipes, too, that she loves and uses often. I can’t wait to try them! Shauna is an excellent writer and her stories draw you in as you truly feel what she was feeling in each situation. I learned so much about entertaining and hosting along the way, as well as many other insights. We travel because I want my kids to learn, as I learned, that there are a million ways to live, a million ways to eat, a million ways to dress and speak and view the world. I want them to know that “our way” isn’t the right way, but just one way, that children all over the world, no matter how different they seem, are just like the children in our neighborhood–they love to play, to discover, to learn. The quote above describes our philosophy EXACTLY. We want our kids to grow up experiencing different cultures, different foods, different activities so that they realize that different isn’t bad. I highly recommend this book. It’s not just about food–it’s about life, and there’s something in it for everyone. I received a copy of this book from Handlebar Marketing in exchange for my honest review.